Single unit variable venturi system delivering accurate concentrations of oxygen (24%, 26%, 31%, 35%, 40%, 50%) with a single unit. 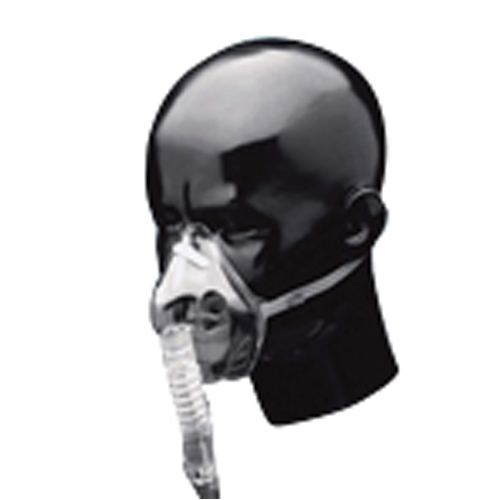 – A transparent, air-entrainment, elongated mask with soft anatomical under the chin shape. A rotating sleeve air entrainment valve allows you to dial in seven different oxygen concentrations: 24, 26, 28, 31, 35, 40 or 50%. – Aluminum nose clip aids in a positive fit for appropriate oxygen % delivery. Over-the-ear or elastic head strap styles. Standard with three channel, crush resistant safety tubing. A high humidity adapter permits use of a nebulizer with this assembly. – Available in…Pediatric and Adult sizes. – Single unit variable Venturi System delivering accurate concentrations of oxygen (from 24 to 50%) with a single unit. Click the SalterLabs Brochure to find out more information.